Spread the Christmas love with homemade ornaments! 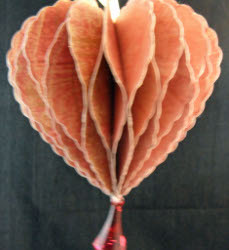 Use a sewing machine and double-sided paper to create a three-dimensional Sewn Heart Ornament from Carlene Eshelman. This project is super easy to make but looks incredibly sophisticated. Place hearts in a stack. Fold seam binding in half, and place bottom between heart 7and 8. Hold seam binding in place and sew a straight stitch down the middle of the hearts. Use the largest stitch possible. Take first heart and place glue dot on side edge, center of heart. Fold other side of heart on to the glue dot. On left heart edge, place two glue dots one third from the top, and one third of the bottom of the heart. Attach dots to previous heart. You will be following the same pattern for the rest of the hearts. Glue dot on side, center; then glue dots on top, and bottom third of heart. Place two glue dots on the side of the gem jump ring. Slip up into bottom of hearts.